Dimension 6 x 3 x 2 ft. The Lanzo Bathtub resembles a simplicity set in classic design. A rectangular, minimalism-inspired design turns simplicity of square forms into perfection of symmetry with this bathtub. Lanzo unique and ergonomic interior provides bathers with comfortable and long body soaks. Crafted using premium acrylic sheets, this tub present thick walls that provide unparalleled heat retention and durability. 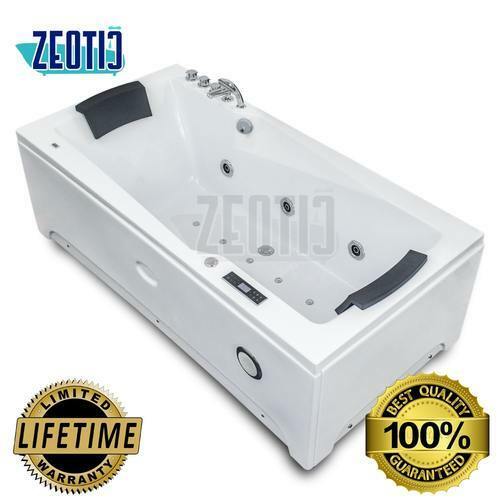 The Lanzo 72”x36” Jacuzzi/bubble massage whirlpool bathtub from Zeotic is made from reinforced acrylic and fiberglass resins for unrivaled strength and longevity. It is offered in a range of finishes, which can be chosen to blend with your bathroom decor or color scheme. This bathtub has six adjustable comfort hydro jets with side-mounted on/off control for hassle-free operation. It has a deep soak overflow drain, which offers maximum water depth and complete immersion, to enjoy a warm and refreshing bath. This bathtub also features a quick connect heater system(Optional), which allows you to warm the water at the desired temperature. It also has a 1.0 HP Blower with 12 Air jets, which creates air bubble in the tub for bubble massage therapy.